If you’re someone who has always wanted to try yoga but didn’t know where to start, take heart! Yoga is not only beneficial for your mind and body, it isn’t as complicated as it looks. There are dozens of poses, and soon you will be able to put them together into an overall routine. Here are three easy ones to get you started on a habit that will improve your balance, strength, and flexibility regardless of your age or physical condition. 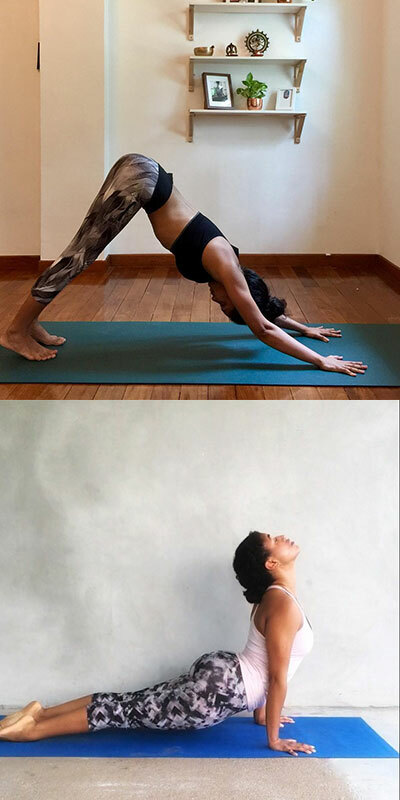 Although these are two separate poses, they work well together. In fact, they’re combined into one move as part of the five Tibetan Rites for longevity and good health. Try to master them separately at first, and then you will be able to move fluidly from one to the other with a little practice. For down dog, start on your hands and knees, placing them directly under you shoulder-width apart. With your palms flat, walk your hands forward and curl your toes under as you raise your hips and straighten your legs. Once you’re in an inverted “V” position and stabilized, get a good stretch through your shoulders, back, and hamstrings by arching your back slightly and lifting your hips higher. The stretch will extend to your calves and Achilles’ tendon if you place your heels flat on the floor. Don’t worry if you can’t get your feet flat at first; just push a little farther in your stretch each day until you can do it with ease. You can also begin upward-racing dog from a kneeling position. As you walk your hands forward, move your head and torso forward and up until your arms are straight, with the hands flat on the floor directly below your shoulders and your legs straight out behind you. Press your face toward the sky while getting a deep arch in your back. To move from downward- to upward-facing dog, lift your head and let your hips drop to the floor while straightening your legs, then move forward until you achieve the final pose; you can also reverse the position back to down dog. Both help improve circulation and spine flexibility. They also stretch your back, abdominal muscles, throat, and the back of your legs. This is the pose that comes to many people’s minds when they think of yoga. It’s often featured in photo spreads when the topic is yoga or meditation. This is a great pose for making you feel centered and empowered. Stand tall and bring your arms straight up and over your head until the palms of your hands meet, as if in prayer. You can even reach higher and take a deep breath, face toward the sky and eyes closed. Once you feel centered, shift your weight to your left leg and slowly bend your right leg as you raise your right foot until the sole is resting against the inside of your left thigh. Once you have your balance, you can lower your hands, still in prayer position, and place them in front of your heart. 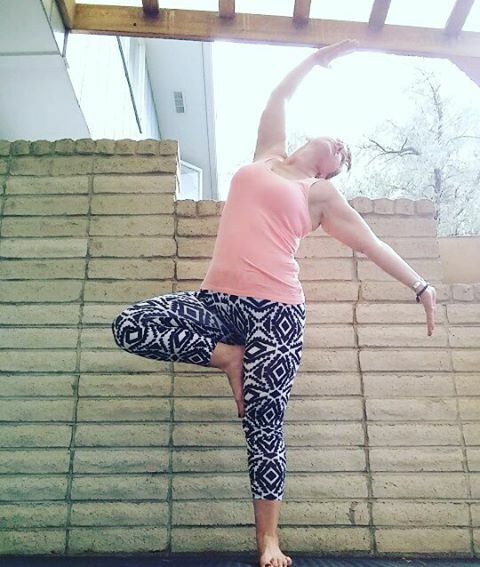 This pose helps with your balance and strengthens your legs from hip to ankle. It also improves your posture and makes your spine stronger. Child pose is often used as the first and last posture in yoga routines that are meant to help you unwind. It’s also a good stress reliever that’s ideal for quieting the mind or when you need a pause while working out. Kneel, resting your buttocks back on your heels, and then reach forward with your hands until your arms are straight out in front of you and your forehead and chest are touching the floor. Breath deep through your nose and exhale slowly through your mouth. Remain this position, breathing into your back, for as long as you like. Child pose stretches your back, shoulders, and the front of your thighs. It also relieves back pain and tension. Yoga is Great For Beginners! Yoga is known to relieve headaches as well as body stiffness and joint pain. It helps manage the physical and emotional effects of chronic disorders like diabetes, osteoporosis and depression or anxiety, and it can even slow down the aging process. Once you get the basic postures down, it will become easier to add more of them to your daily fitness routine. You’ll soon find that you’ll be able to push yourself further than you ever imagined possible. If you don’t feel comfortable taking a class at first, there are most likely studios in your area that have private instructors, and free courses are available online.